On March 23rd 2016 CYC contractors removed most of a large diseased tree immediately adjacent to the site MCT manages. They did a thorough and very careful job, minimizing damage to adjacent trees in our area. On March 4th the field-work co-ordinator popped across to help with litter picking on Hob Moor, between one of the schools and the beck. Only 2 large bags, but every little helps on such a big site. He noticed en-route that the Community Pay-back team had done an excellent job clearing litter, cans and bottles dropped under cattle grids. 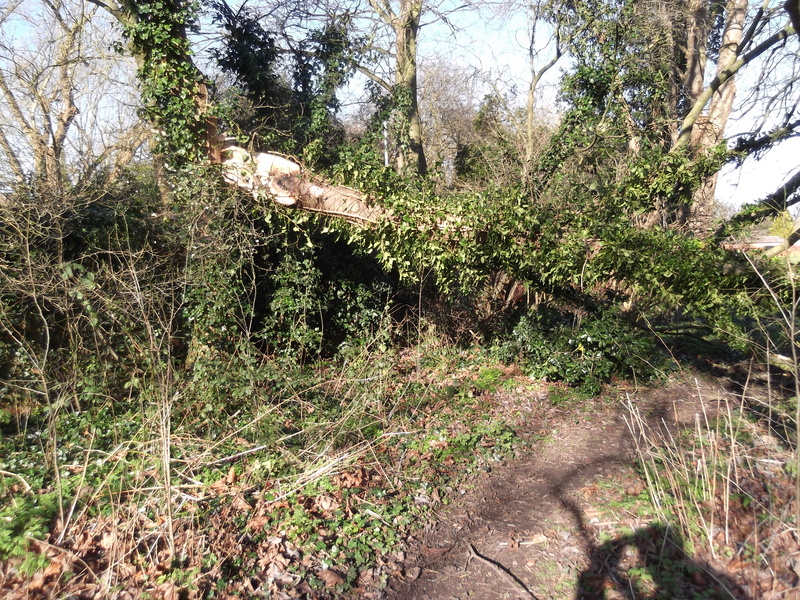 The high winds in February 2016 snapped of a very large branch that fell onto Little Hob Moor, just round the corner from the MCT-managed area. MCT was luckier, but it shows the need for careful woodland management. 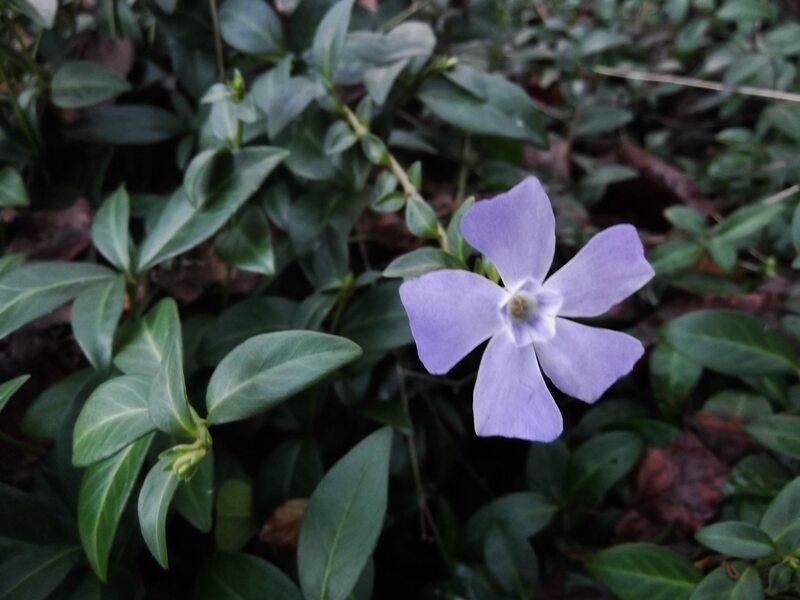 It was nice to see Vinca flowering on December 27th beside the path down to the Railway Pond. We also liked the extra seats around the pond. 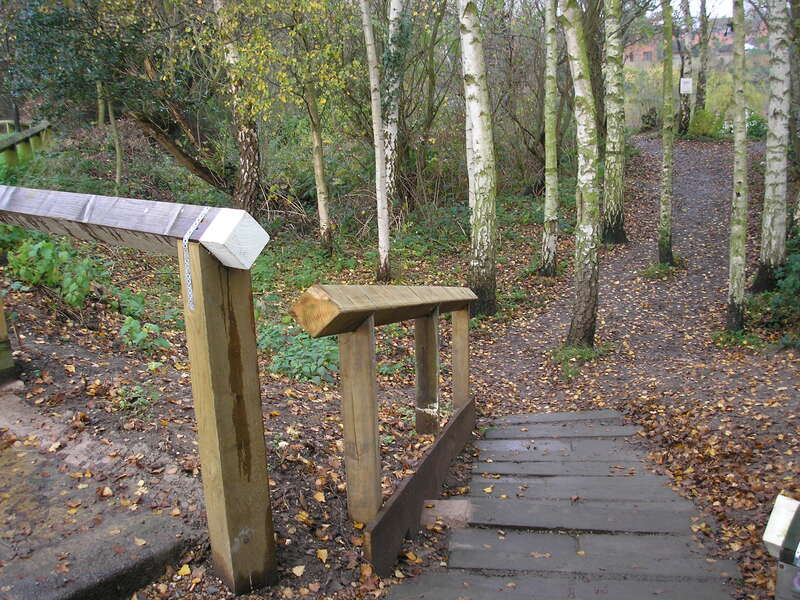 Ian Tomlinson has been improving the woodland west of the path where it joins Little Hob Moor. We think he’s doing a great job. He opened up a path from the north side of the woodland through to the MCT area recently. The plan is to increase the wild-flower diversity growing under the canopy as part of a pleasant walk. 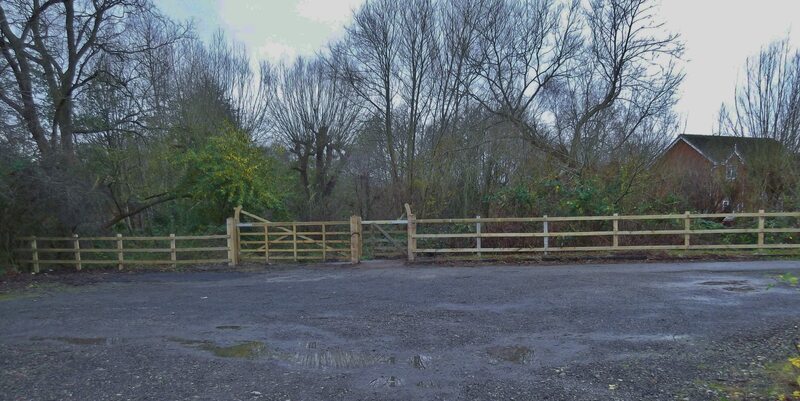 CYC workers have now erected a fence and gate between the car park and the path down towards the Railway Pond. This improves safety and stops vehicles using the area for illegal disposal of waste. The Friends of the Railway Pond and Mayfields Nature Reserve had a celebration of their impressive achievements beside the pond on Sunday May 31st, 2015, between 11 a.m. and 4 p.m. Discussion there prompted them to add a simple but very useful extra seat beside the lake, taking advantage of an existing tree stump. 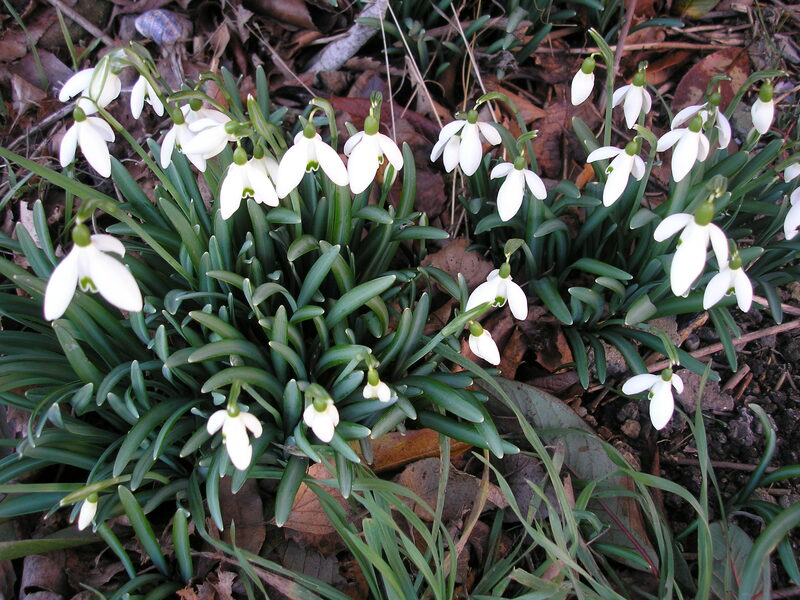 Not much is in flower on the Mayfields site in mid February, but we couldn’t resist adding Pam’s photo of the Snowdrops in the area managed by the Friends of the Railway Pond and Mayfields Nature Reserve, which are looking really beautiful just now. The Friends of the Railway Pond and Mayfields Nature Reserve have done a great job in improving access to the south west corner of the site, so it’s no longer necessary to climb over the low fence. They have added a really useful handrail to aid those who might be in danger of slipping. Now the steps are in place too it’s a really impressive improvement and much safer. The Friends of the Railway Pond and Mayfields Nature Reserve (FRP & MNR) also managed to install a substantial shed in December for storage of tools and equipment. It has been carefully located and painted to make it as inconspicuous as possible to casual passers by. They had to widen the path to get it in position but have worked really hard in the wintery weather to make the path as attractive as possible again. The pond they look after on the south side of Nelsons Lane had very low oxygen concentrations in autumn of 2013 because of the high willow woody litter inputs, low amounts of oxygenating plants and algae, and excessive shading and shelter from wind by surrounding trees. When the temperature suddenly dropped sharply quite early in September, water already low in dissolved oxygen sank and mixed with water from depths up to 4.5 m with virtually no oxygen at all, seriously further diluting the oxygen concentration. The result was sadly loss of a number of fish. The fishermen did their best to aerate the water and achieved considerable improvement. With no mains electricity on site this meant the use of compressors for power generation at times, but noise was kept to the minimum they could while saving as many fish as possible. Subsequently a lot of the surrounding trees and vegetation were cut back to improve the breezes blowing across the water surface to help with aeration. This also increases the light levels reaching the water surface which helps with oxygenation by photosynthetic organisms in daylight hours. 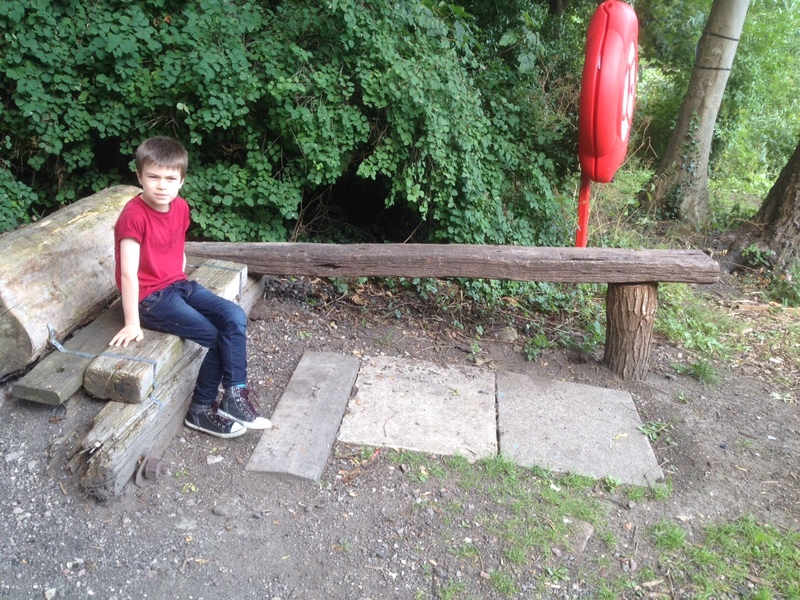 By August 2014 the fishing group had managed to fit a power supply so the aerator is now much quieter. Oxygen levels in the water are good and the fish seem to be thriving. 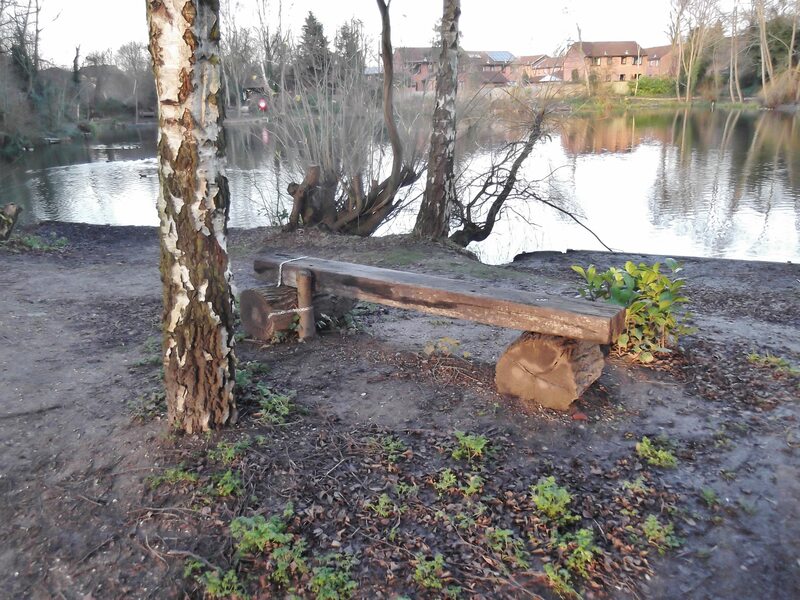 The Friends of the Railway Pond have also done an excellent job in improving the pond margins and surrounding land, and have installed pleasant additional paths through the woodland. 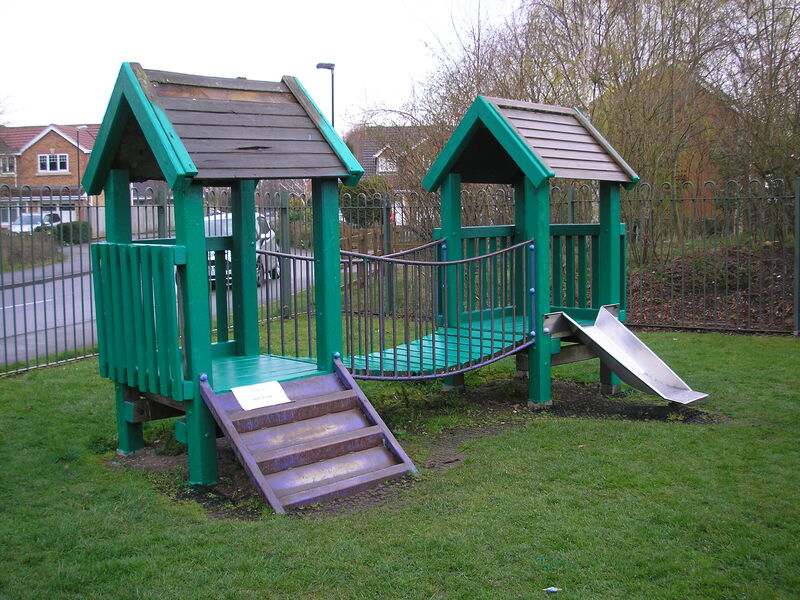 The Nelsons Lane playground is still managed by the city of York Council. 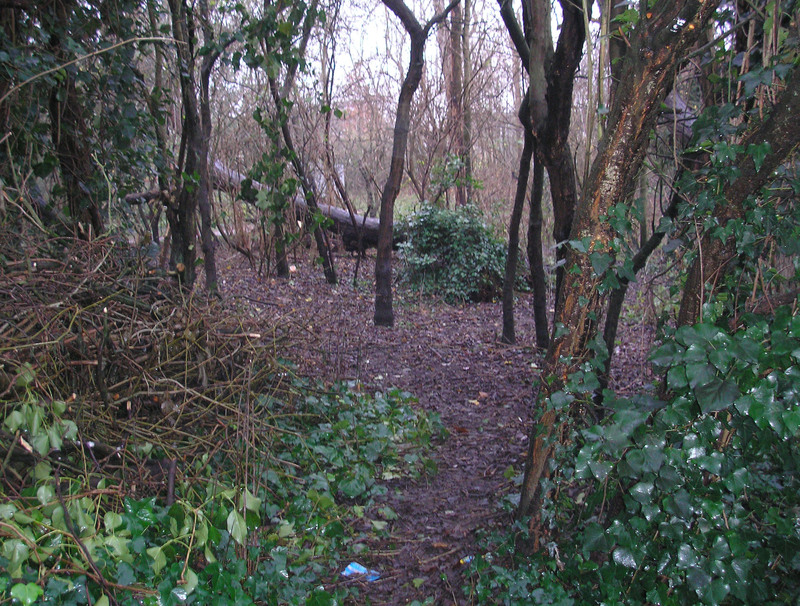 MCT however has been clearing brambles and thorny roses growing through the surrounding fence on safety grounds. 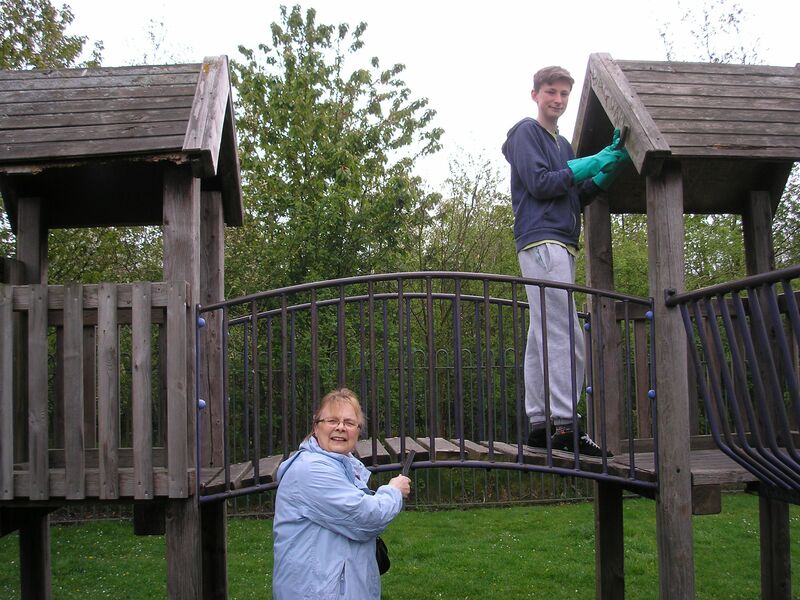 The Chair of the Chase Residents Association, Anne Leggett, arranged painting of the playground equipment. Jenny Cairns of CYC made good progress at the start of April 2014 in Smarter York week, with help from local volunteers, including John Parkinson, Malcolm Cresser, Luke Burnett and Pam Brown. Work continued later in the month when Douglas Burnett and Louise Cresser joined the team. Once preparation was finished they acquired the rest of the paint needed to finish the job form CYC and CRA funds (including some raised at the Carol concert at Christmas). Rotted or missing roof timbers, as in Pam’s photo on the right below, were replaced. 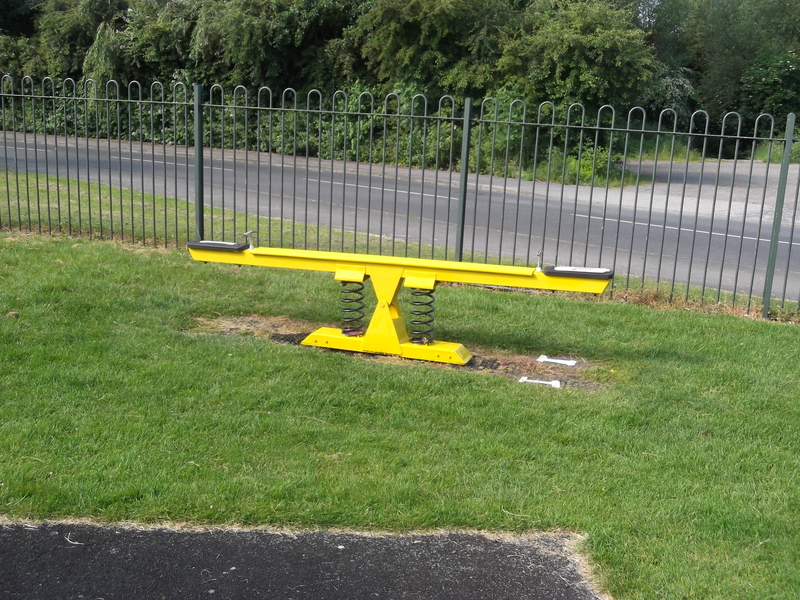 The new bright yellow seems very popular with youngsters using the equipment. Part of the extreme north western end of the site the land will remain under CYC management. Ian Tomlinson, the local tree warden, has recently done a great job opening up that area, and plans to increase the number of English bluebells growing in the shade of the woodland there, which should look very attractive. It will be important though to make sure that the shade in spring is not too dense around the hawthorns for the bluebells to establish.